The cost effective way of printing sticker labels for name badges in real-time. The ultra fast print speed of less than 1 sec per label is a huge time saver for big events. Both Brother QL-720NW (black) and QL-820NWB (white) supports both WiFi and LAN connectivity. 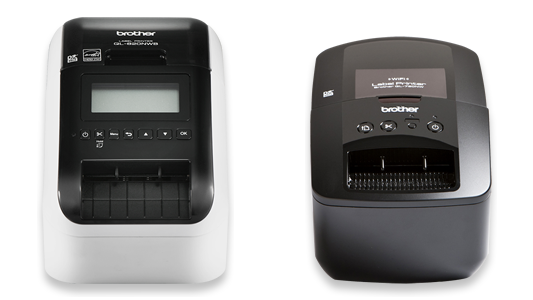 The Brother QL-820NWB supports Bluetooth printing as well that connects to your iPad or computer directly. High fidelity printing for crisp text, graphics and barcodes. Ultra fast. Less than 1 sec per label. Compatible with major event apps and our check-in system. No fuss wireless connectivity. Unclutters your reception desk. Built-in automatic tape cutter for precise cuts after each label is printed or to create custom size labels. Easy-to-use drop-in paper roll cartridge. No ink or toner needed. Dimensions 5.0" x 9.3" x 6.0"
Dimensions 5.0" x 9.2" x 5.7"